A few days ago, I scored a baseball game for the very first time. It was interesting and fun, but a bit stressful and headache-inducing – not at all because it wasn’t enjoyable, but because there is so much to know and apply when scoring a game with paper and pencil. For people who have been doing it for a long time, I know it becomes second nature – like knowing shorthand or basically, another language – but for a first-timer like me, it was pretty crazy! It was a funny experience; on one hand, I felt like I was able to retain more information about exactly what happened (since I had written ALL of it down), which was great, but at the same time I felt like I wasn’t able to be as “present” in the exciting moments of the game, since I was so focused on getting the records right. 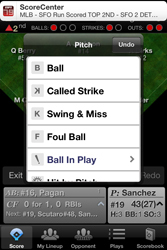 I wondered if there might be an easier, (and maybe more “techie,” because I’m a geek) way to score a game, and it turned out there was: an app called GameChanger, which I downloaded promptly and got to explore a bit the other day. It seemed really robust, fun to play around with, and extremely useful for record keeping. Awesome! If you have kids in little league or play in a league yourself, I’d highly recommend it! 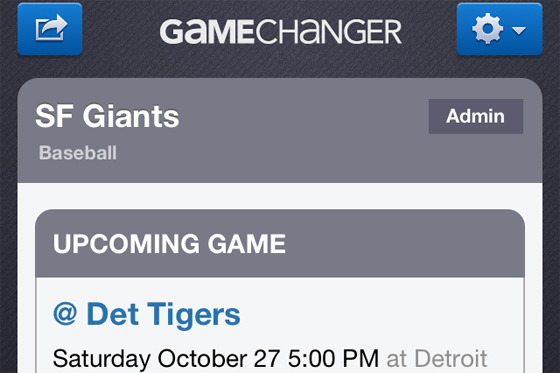 Well today is the third game in the 2012 World Series (woohoo!) 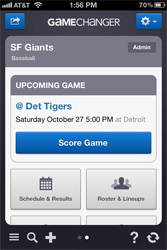 between my beloved San Francisco Giants and the Detroit Tigers, and after a one-game break, I’m ready to try scoring another game. Since scoring Game 1 on paper was super cool but also pretty stressful, I wanted to give GameChanger a try this time. 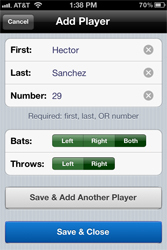 If Sanchez had already been in my roster, making him the DH would have been as easy as clicking on his name from my list. 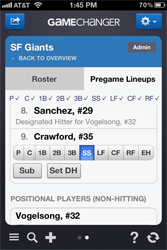 In the pre-game lineup setup, you just click on your activated players’ names to change their info. So easy! Especially since you can set up as much info as you can beforehand (like players on the bench) instead of having to write it all feverishly when you get the final lineup just before the game. 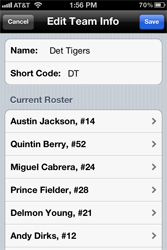 This kind of thing made it way easier for me to set up the Detroit lineup, especially since I’m not as familiar with them as my boys (but of course, have been way more familiar with them in the past few weeks … LOL). 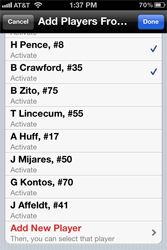 I love how GameChanger makes use and functions really streamlined and simple. 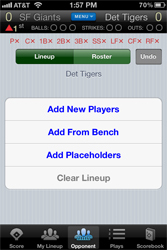 Here, I’m just checking out what I can do with this upcoming game tonight – if there are any changes in the lineups, I just click on “Roster & Lineups”, and make whatever changes I need. 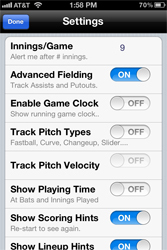 And I love all the options you have to choose from for your scoring in the Settings section. I can make this as simple or as complex as I’d like! 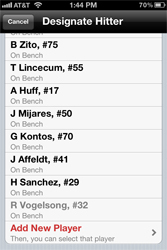 Here I’ve added Delmon Young to the bench (without a position), because I know he’s going to be the DH for Anibal Sanchez, the Tigers’ starting pitcher. 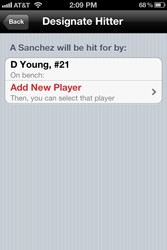 It’s so easy to designate him here – I just click on A. Sanchez in my activated player roster (lower down on the screen so not shown there), click “Set DH,” and select D. Young. SO easy. I am seriously loving this app! And here we go! 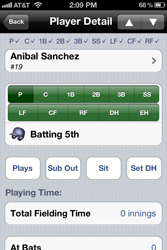 First up to bat is Angel, and GameChanger shows me my pertinent info and the players on the field. 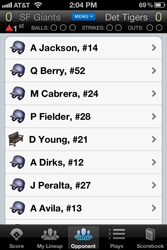 The first inning was relatively uneventful which was good for my newbie scoring, but look how easy it is to keep track! 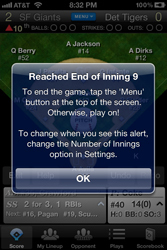 After you’ve recorded three outs, GameChanger prompts you to switch to the bottom half of the inning, and gives you a recap of what you’ve recorded, plus who’s due up to bat next. Very helpful since you can also cancel out if you realize you’ve made a mistake; you can then go back and change your errors and resume. So cool! 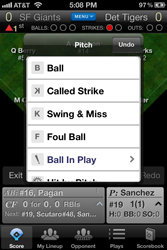 GameChanger even takes the info you’ve provided and produces a play-by-play and box score sheet for you. This is SO awesome. If you’re interested in scoring on paper, this can really help you learn the system and symbols, too! Through the Fifth and Sixth both teams’ pitchers were just dealing – no one was able to get any hits! 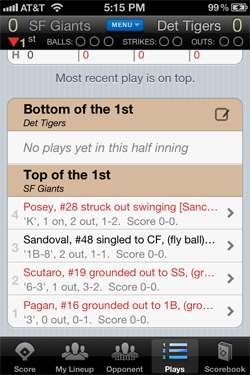 But in the bottom of the sixth, Vogey started to get tired, and his relief was none other than Big Time Timmy Jim! I got to do a(n AWESOME) pitcher change! Go Vogey! Go Timmy! Go GIANTS!!! 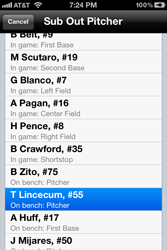 Timmy kept the Tigers scoreless (and hitless!) for two solid innings and Sergio came in to finish them off in the Ninth – wahoo! Game 3 in the bag! 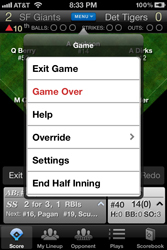 GameChanger prompts you and gives you options in case you need to continue into extra innings (we didn’t!) or make any changes. I really appreciate how streamlined and helpful this app is. That darn ESPN ScoreCenter! Still faster than me! Ha! 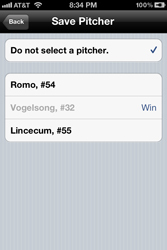 I just had to select my Winning (Go, Vogey! 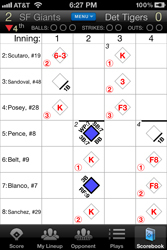 ), Losing, and Save pitchers. 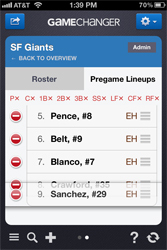 GameChanger also puts all the pitchers each team has used together for you so you can select easily without having to try to remember who may have pitched (not that I’d have any trouble here! Everyone was strong and just freaking GIANT tonight. And my first GameChanger-scored game is in the books! This was SO much fun. 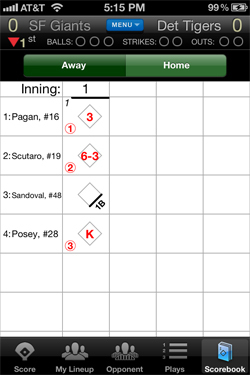 I’m glad there wasn’t too much insanity for my first try at scoring with this app, and of course the Giants’ WIN makes this another fantastic game to be recording! 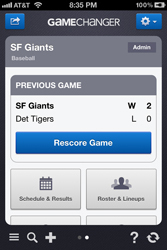 I’ve REALLY enjoyed my experience with GameChanger; if baseball, softball, or basketball is in your life, check it out!